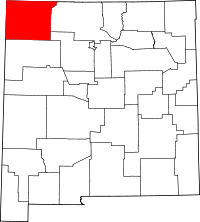 San Juan County is located in the northwestern part of New Mexico, and, in fact, is home to the well known area of Four Corners, the spot where the borders of New Mexico, Arizona, Utah, and Colorado all meet. The county seat of Aztec, NM, named for the nearby Aztec Ruins National Monument, is home to the County Clerk's office at 100 S. Oliver in Suite 200. In addition to allowing members of the public research records at the office, the Clerk also provides an online index that contains marriage records dating from 1887 to the present, plats and surveys from 1890 to the present, and probate records also from 1887 to the present. Individuals can sign into the database using a guest account, and copies of records can be obtained by visiting the office in person.